1.Preheat oven to 350°. Line 13 x 9-inch baking dish with aluminum foil with overhanging sides; spray with cooking spray. 2.Prepare Brownie: In small saucepot, heat stout to boiling over high heat; reduce heat to medium-low and simmer 5 minutes or until reduced to about 2/3 cup. Remove from heat; cool. 3.In large bowl, with mixer on medium-low speed, beat sugar and butter 3 minutes or until light and fluffy. Add eggs, 1 at a time, scraping sides of bowl with rubber spatula after each addition. Add chocolate syrup, vanilla extract and stout; beat until combined. Add flour and salt; beat just until combined. Pour batter into prepared dish. 4. Bake 30 minutes or until toothpick inserted in center of brownie comes out clean; cool in pan on wire rack 30 minutes. Refrigerate brownie at least 1 hour or overnight. 5.Prepare Cream Filling: In large bowl, with mixer on low speed, beat powdered sugar and butter 3 minutes or until light and fluffy, scraping sides occasionally; turn off mixer. Add Irish cream; beat on low speed 2 minutes or until smooth. Evenly spread filling over surface of brownie; refrigerate while preparing glaze. 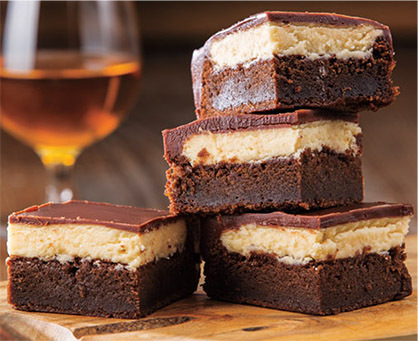 6.Prepare Chocolate Glaze: In large bowl, add chocolate morsels and whiskey. In small saucepot, heat butter and corn syrup to boiling over medium heat; pour over chocolate mixture and let stand 2 minutes. Whisk chocolate mixture until smooth; evenly spread glaze over surface of filling layer. 7.Refrigerate at least 2 hours or overnight. Use foil to lift brownie out of dish. Cut brownie lengthwise into 4 strips, then cut each crosswise into 6 bars. Use a large knife dipped in warm water and wiped dry to cut brownies. Wipe the knife blade clean and dip in warm water between cuts.